Pinnick (l) in discussion with Akinwunmi (m), while NFF GS Sanusi (second left), NFF VP2 Shehu Dikko (second right) and SAFA President Jordaan (right) watch. Super Eagles’ stand-in captain Ahmed Musa and Super Falcons’ opposite number Onome Ebi took the big gongs at the second edition of the AITEO-NFF Football Awards that held in Lagos on Monday night. 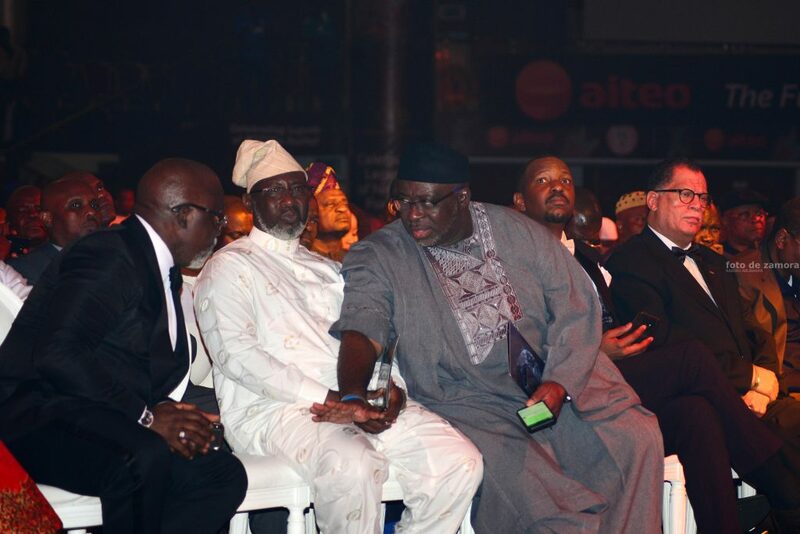 The project started only last year, but as happened during the first edition, dignitaries and guests came from all over Africa and other parts of the world, and the class and delivery of the event is fast high setting standards for other Awards, national and continental, to match.The highlight of the night, by miles, was the special recognition of the Super Eagles’ Class of 1994 – the squad widely nicknamed ‘Golden Generation’ after qualifying Nigeria for her first –ever FIFA World Cup finals. The `94 class also won the Africa Cup of Nations on away soil for the first time and came within 100 seconds of a quarter final place at the World Cup in the United States of America.Those in attendance from the history-making class included goalkeepers Peter Rufai and Alloy Agu, defenders Austin Eguavoen, Uche Okechukwu, Benedict Iroha, Nduka Ugbade and Taribo West, midfielders Mutiu Adepoju, Austin ‘JJ’ Okocha, Sunday Oliseh and Edema Fuludu and forwards Finidi George, Samson Siasia and Daniel Amokachi. Omoyemi Yekini, daughter of the ‘goalsfather’ Rashidi Yekini, stood in for her late father as well as the four others who had passed on: team captain Stephen Keshi, goalkeeper Wilfred Agbonavbare, defender Uche Okafor and midfielder Thompson Oliha. Super Eagles legend, Emmanuel Amuneke, who led the Tanzania senior national team to their first Africa Cup of Nations (AFCON) for the first time in 39 years, could not make it to the award. The taifa Stars of Tanzania sealed a spot at AFCON 2019 after a 3-0 home win over the Cranes of Uganda in a qualifier on March 24. Also Michael Emenalo, Emeka Ezeugo, Efan Ekoku, Isaac Semitoje and Chidi Nwanu could not make it down to Nigeria for the ceremony.While a couple of the players present on Monday night did not make the final cut for the World Cup in America, six members of the group went ahead to join the Dream Team and return to America to conquer – by winning Africa’s men’s football gold at the Centennial Olympics in Atlanta two years later.Secretary–General of FIFA, Ms Fatma Samoura (the first African/first woman to occupy the position) was honoured with the NFF Order of Merit Award. 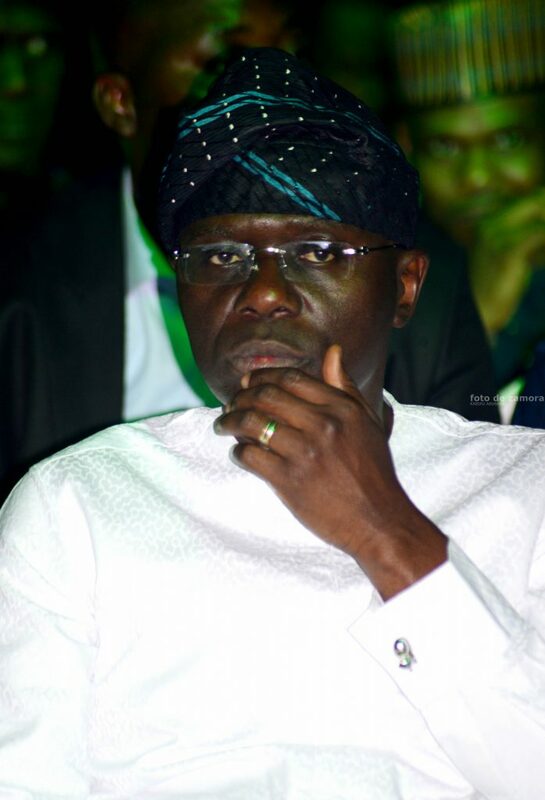 Presidents of 18 Member Associations of FIFA, the Abia State Governor (Chief Okezie Ikpeazu), the Acting Governor of Edo State (Comrade Philip Shaibu), two Governors-elect (Babajide Sanwo-Olu of Lagos State and Abdulrazak Abdulrahman of Kwara State) and captains of industry, political juggernauts, A-class artistes and heavyweight stakeholders of the game watched at the Eko Hotel and Suites, Victoria Island, Lagos. Members of the NFF Executive Committee and Management, Members of the NFF Congress and chairman of various Clubs were also in attendance. President of the Nigeria Football Federation and First Vice President of CAF, Amaju Melvin Pinnick, once more eulogized the present administration of President Muhammadu Buhari (GCFR) for providing the conducive environment for football to thrive and for total support for the NFF and the various National Teams, while calling on Nigeria’s other billionaires and well –heeled companies to emulate AITEO Group and boost the development of football in Nigeria. AITEO, Nigeria’s leading energy solutions company, also stands erect as Official Optimum Partner of the NFF and sponsors of the Federation Cup. It also bankrolls the annual African Football Awards organized by CAF. Its team on Monday night was led by Deputy Managing Director, Mr. Francis Peters and included the Executive Director, Mr. Andrew Onyearu. 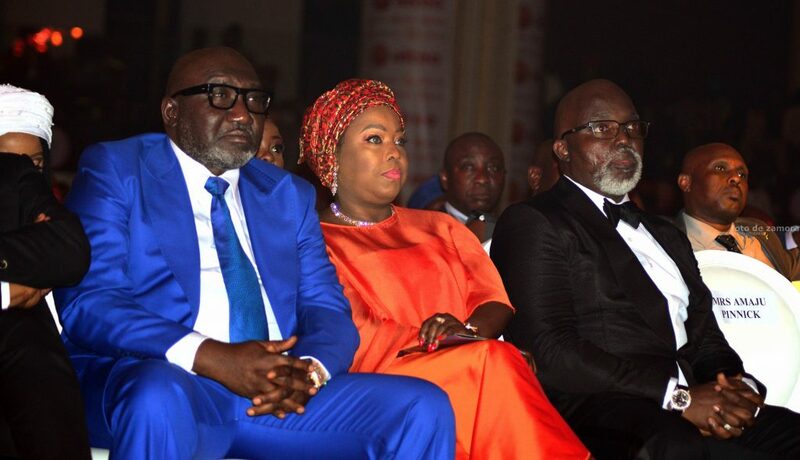 Business mogul and politician, Chief M. K. O. Abiola was honoured with the NFF Presidential Award, while Governor Akinwunmi Ambode of Lagos received the Lifetime Achievement Award for his hefty support for football projects and programs of the National Teams. There were several members of the CAF Executive Committee, namely Dr. Danny Jordaan of South Africa, Suleiman Waberi of Djibouti, Aisha Johansen of Sierra Leone, Moses Magogo of Uganda and Sita Sangare of Burkina Faso. All noted the good and great works that Samoura, who spent 21 years working for the United Nations, has been doing as chief accounting officer of FIFA since she assumed office three years ago. NFF First Vice President and Chairman of the Awards organizing committee, Barrister Seyi Akinwunmi said the Federation decided it was apt to honour the Super Eagles’ Class of 1994, 25 years to their AFCON –winning exploits and FIFA World Cup performance. It would be recalled that Nigeria was named the second most entertaining team of USA 1994 World Cup. As A-list comedian Bovi and Malian broadcaster Mariam Diakite compered, the dignitaries including Presidents of the Football Associations of Zambia, Zimbabwe, Angola, Guinea Bissau, Gambia, Equatorial Guinea, Togo, Ethiopia, Benin Republic, South Sudan, Tanzania, Rwanda and Liberia applauded the winners with vigour. 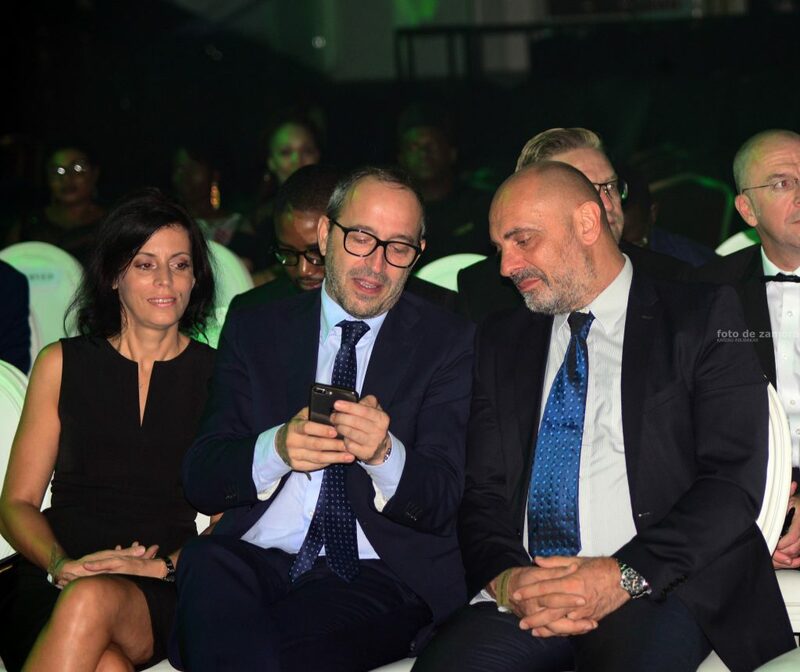 Among the winners were Super Falcons’ coach Thomas Dennerby, Super Eagles’ ace winger Samuel Chukwueze and Enugu Rangers’ coach Olugbenga Ogunbote. Responding on behalf of the 1994 Eagles, defender Austin Eguavoen expressed deep appreciation of the squad to the NFF for the honour, while also using the opportunity to plead that NFF should help the players pursue the Federal Government’s promise of a house for each member of the squad, following the AFCON triumph in Tunisia 25 years ago.